The next generation i20 WRC is the next step in Hyundai Motorsports quest for racing supremacy, and the car is almost ready to roll. It will be the vehicle that the team uses during the 2016 FIA World Rally Championship season. The official unveiling of the new i20 WRC will be held this week, with the team factory in Alzenau, Germany the location of the show. The vehicle was originally slated to enter the racing world at the midway point of the 2015 season, but Hyundai Motorsport thought it was a better idea to wait until the new season began. 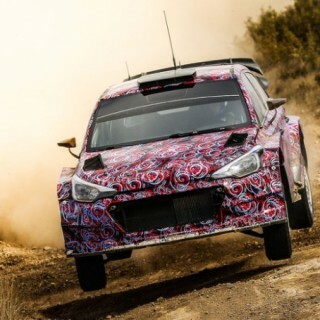 The car was certainly put through its paces this year, as the 2015 i20 WRC has been subjected to a test and development regimen that saw it log more than 8,000 km since March of this year. The vehicle was tested on gravel and tarmac road surfaces, with the testing taking place in France, Germany, Finland, and Spain. The test were performed concurrently with the 2015 WRC season, which proved to bea successful one for Hyundai. The Hyundai Motorsport team moved up the testing program as the year progressed, moving from basic testing all the way up to performance runs later in the year. The team seems to be very happy with the progress made in the development of the car, as they have now submitted all the necessary documentation to the FIA for official confirmation. The homologation process is expected to be completed before the end of the month. The hope is that the homologation process will be finished shortly after the car is unveiled in Germany. After that, it’s all just a matter of waiting for the season to begin.